I have been riding in schooling dressage shows and have been successful, so now I feel ready to enter a recognized show. Since there are several right in Aiken, I was going to give it a try. I do have a few questions that I cannot seem to get the answers to. 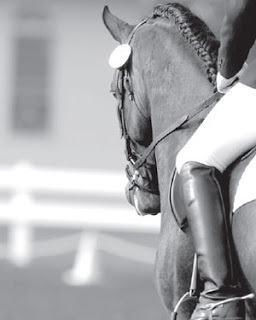 First, can I enter a recognized show if my horse is not registered with the United States Dressage Federation and the United States Equestrian Federation? I heard I could go in the Introductory classes. Are there others? Second, I don’t know how to braid. I heard that I don’t need to. Is that true? It's great that you feel accomplished enough to graduate from dressage schooling shows to recognized dressage shows. Aiken is a convenient place to do this since there will be five recognized dressage shows here in 2011. There are several classes you can enter at a recognized show even if you or your horse are not yet registered with the USDF or USEF. For instance, you can indeed enter any of the Introductory classes. These are considered "starter" tests. Although you can win ribbons in these classes and they will provide valuable show ring experience, you cannot earn points to qualify for year end awards from the national dressage associations. Introductory classes are designed for horses and/or riders that do not feel ready for the difficulty of Training level, as well as for horses that are not yet registered. The classes are open to all riders – juniors, amateurs and professionals alike. As of 2011, there are three Introductory level tests. Tests A and B have only walk and trot work, while Introductory C (new this year) has some brief canter work. The judge will score your test the same way as he or she scores the standard dressage tests at the show, except in the collective marks. The final collective mark (Harmony) is replaced in these tests by Geometry and Accuracy. The movements are scored on the same scale as those in rated tests. Because of this, Introductory classes are a great way to be assessed and critiqued by a nationally rated (or even internationally rated) judge. They are also a good place to practice riding under USEF rules. Many shows also offer Opportunity classes in Training and First level – show management is allowed to offer two Opportunity classes per level per day. At higher rated shows, there may even be an Opportunity class at Second level. For instance, you may find that a show has a class called "Training One Opportunity." An Opportunity class is open to horses and/or riders that are not registered with the USDF or the USEF. Again, these classes follow USEF rules and are judged on the same scale as rated classes, although you cannot earn points for year end awards. Opportunity classes are open to any rider and any horse. It is also possible to enter the regular rated classes if you are not yet a member of the USDF and the USEF. However, you must pay a one-time USEF and a USDF non-member fee, if you are not a member of both organizations. The horse would also have to have a Horse Identification (HID) number. You can get this online for a fee. These fees can really add up, which is one of the reasons why the USDF created the Introductory and Opportunity classes: they give people experience in a rated show atmosphere before they make the commitment of lifetime registrations. To answer your second question, braiding is not required, so the condition of your horse’s mane should not affect your scores. (According to rule DR121.7 "Braiding of the horse's mane and tail is permitted.") However, I strongly recommend braiding your horse. Most judges like to see horses presented traditionally, and almost all competitors will have their horses braided at a recognized dressage show. If you do not braid your horse, you may feel out of place. A braided mane also makes it easier for the judge to see your horse’s frame and outline and how correct his muscle development is. If you do not know how to braid, you should not have any trouble finding someone to help you. Almost all recognized shows have at least one professional braider available who can make your horse look show-ready for a small fee. I would suggest that you check the show program, because there is often a braider listed, and sign up early for this service. So, as you can see there should be plenty of classes to choose from at a recognized dressage show, even if you and your horse are not yet registered and you haven’t mastered neat and tidy braiding. I hope this information helps you and that you will take advantage of the recognized shows here in your own backyard. Good luck!